SAMEER Chennai Recruitment 2018 2019 Application Form for 10 Research Scientist, Project Management Assistant-B Posts Download Application through Official website http://cem.sameer.gov.in. 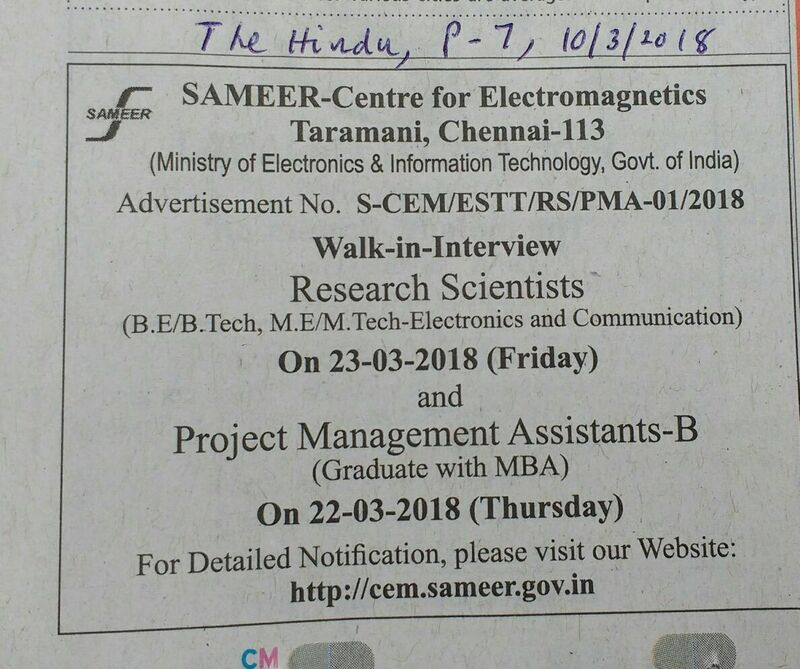 SAMEER Chennai Research Scientist Jobs Notification 2018 Released. 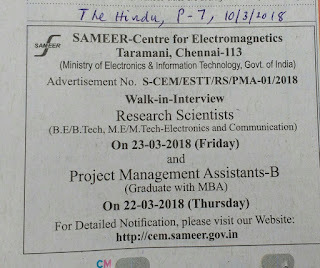 SAMEER Chennai invites Walk in Interview for appointment in following Research Scientist post in Society for Applied Microwave Electronics Engineering & Research. Candidates are requested to Download Application through Official website http://cem.sameer.gov.in. Prospective candidates will have to before Walk in Interview carefully reading the advertisement regarding the process of examinations and interview, eligibility criteria, Offline registration processes, payment of prescribed application fee/intimation charges, SAMEER Chennai pattern of examination, SAMEER Chennai Syllabus, SAMEER Chennai Question Paper, SAMEER Chennai Walk in Date, SAMEER Chennai Result Date etc. 1. Project Management Assistant-B - Graduate with MBA (Preferably Finance) from recognized University (With or without experience) with minimum 55% marks or equivalent grade. 1. Project Management Assistant-B - Rs. 30,000 - 38,000/- (consolidated salary).